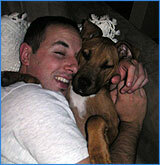 Hi Daniel, I was given an american staffordshire when he was four months and had never had a puppy before. I was looking around for a good training manual and came across Secrets to Dog Training. I have used it right from the beginning and am absolutely amazed at how much I have learnt and how much progress Lincoln has made in the short time using the Secrets to Dog Training guide. I am now looking at starting Lincoln on some advanced learning techniques and am very confident in using the guide to help him along.